I’ve had a bit of writer’s block — too much to write about, not too little — so I’m a bit late putting this up. This past week, I would be all set to write about one thing that was going on around here when something else would snag my attention, and off I’d head in that direction. Today, since I was down to the wire, I just decided I’d go with whatever thought I seemed to light upon the moment I sat down at the computer. Here’s how that went . . .
Coffee cup in hand, I clicked on the San Francisco Chronicle first to get the weather report. 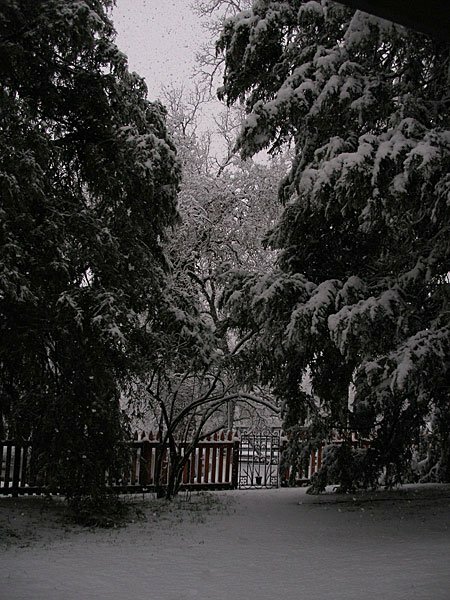 We are longing for rain, snow, mist, fog, anything at all resembling precipitation. We’re in the midst of a strong La Nina out here, which means cold and dry. Boy, is it dry. However, in my ADD mode, a headline grabbed my attention away from the weather report. “Neighbors Up In Arms Due To Heinous Noise from Hospital” it read. Dear God, I thought, thankyou thankyou thankyou that I don’t have to go through that anymore. San Francisco may be a beautiful city, but the thought of living next to a massive, humming air filter system that sounds like a giant leaf blower and makes using your backyard impossible is enough to turn my blood cold. A good way to deal with insomnia, I’d say. Besides, It’s so much easier to feel that way when not woken by a giant, humming, hospital air- conditioner, or whatever it is, that has a tendency to kick in at 3 am in the morning. Again — thankyouthankyouthankyou. 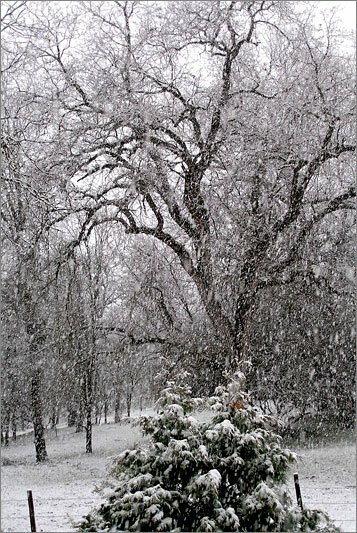 For me, this poem captured everything that was going through my mind — the longing for snow, the lovely sound of the owls when I wake in the middle of the night, and the excitement, tinged with, if not dread, certainly concern for the coming year. And also the poem gave me the comfort of knowing that, no matter what happens in 2012, La Nina will turn again into El Nino, and I will once again be able to hold my hand out to the glittering snow or the cold rain. Here’s a poem to welcome in the coming year. to name it — the owl, I mean. My daughter and son-in-law are arriving tomorrow for Christmas. 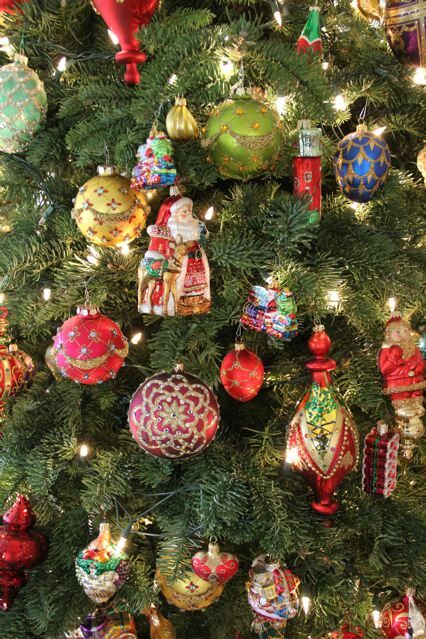 I’ve got trees in all the rooms, and everything is merry and bright! When I saw how this picture turned out, I realized this was a perfect place for a family Christmas recipe, so here’s my little gift for you, dear readers. I think I might have married Dave just to get my mitts on these cookies! Cream butter and sugar. Add vanilla and incorporate. Stir in pecans and mix well. Form the dough into “fingers” about the size of your thumb, maybe smaller, and put on ungreased cooking sheet about an inch apart. Remove from oven when slightly golden colored and roll in powdered sugar while they are still warm. Roll in powdered sugar again when cooled. Pioneer Woman has what she calls her lodge — a place where she cooks and entertains — and so do I. Okay, so compared to PW’s lodge mine is more of a lodge-ette. Most of the time (and when we don’t have guests), this place is sports central for Dave and his buds. Every Tuesday morning, you’ll find me vacuuming up the cloud of popcorn and chips left on the floor. What can I say? However . 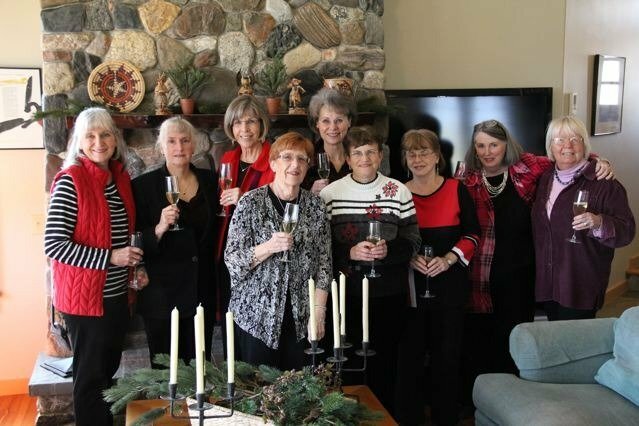 . . once a year I gussy this place up and give a girls’ luncheon for some of my Sierra Mountain sisters. I love the fireplace in my “lodge-ette”. It’s made from stones which come from the creek near my house. Talk about building local! And here’s a picture of part of the view from . . . well, from THE LODGE. Maybe that’s what we’ll call it. See if it sticks! Up to now, it’s been called “the house on the hill” to distinguish it from what we call “the house in the valley”. Anyway, for this luncheon, I made Paula Deen’s “Chef Jack’s Corn Chowder“. Girls, I made it MINUS the addition of the extra butter. Just read the recipe and you’ll see why! For ten ladies, I doubled the recipe. While Paula Deen’s recipe says it serves 8-10, that must be 8-10 first course sizes. Just so you know. And I did serve it with the suggested Chardonnay. But my favorite part of the meal was the salad I served as a first course— Spinach Salad with Mandarin Oranges and Candied Almonds. ( Wine pairing : a dry Riesling from Washington State.) The salad is adapted from Pam Anderson’s cookbook Perfect Recipes for Having People Over. 10-15 cups of greens–spinach, arugula, Boston Lettuce, or a combination of them. Thinly slice the onion and soak it in the vinegar for a half an hour. No more! Save the vinegar. Drain the oranges and add to greens. Toss with reserved vinegar, oil and salt and pepper. Add more vinegar if it does not taste sharp enough. Add more oil if the greens are not nice and shiny. In a dry skillet, toast one cup of almonds until fragrant and golden. Mix 1/3 cup of sugar with 2TBS. of water until dissolved. Pour the sugar water over the almonds and toss until coated. Cool sugared almonds in a pie pan. Here’s a toast to all y’all from all of us! Rilke: A Few More Warm Transparent Days . . .
There’s a poem by the German poet Ranier Maria Rilke that begins “Lord it is time. The huge summer has gone by . . .” which I kept thinking about as I walked around the ranch looking for the cows. The good news is that Big Mac is better. The other news is we have a new female calf named Lightbulb. Here’s a kind of blurry picture, but you’ll understand the name. She seems to be very happy these days with her little herd. Anyway, about halfway up the hill I heard a meowing sound. It was Dudley the cat, following me on my walk. He wanted me to wait up for him. It takes over an hour to walk around a little loop road we’ve carved out for ourselves. The road goes through a meadow, up a hill to a grove of blue oaks, down a path covered with buckeye, past a hill of ceanothus and bay laurel near the pond. 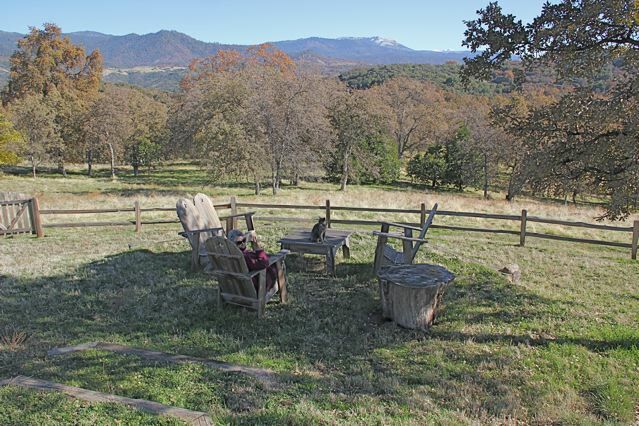 There are lots of hiding places for bobcats and coyotes, and Dave even saw a mountain lion once, sitting on a rock cleaning his face with his paws. I don’t really like Dudley to follow me this far because of all the wild critters, but I wasn’t turning back now. I figured I could just carry him through the wooded places. Anyway it was such a beautiful, warm November day the two of us stopped in the meadow to take in the view, which is where Dave found us and snapped this picture. I should be in my office adding more copyedited chapters to my novel for you all to read. You’re stuck on Chapter Five, I know. But, it was so beautiful out can you blame me? I keep hoping for a really rainy day. Well, rain or no rain, I promise in the next few days I’ll have a couple more chapters up. Meanwhile, here’s that Rilke poem I mentioned. Tags : | Comments Off on Rilke: A Few More Warm Transparent Days . . .
I’ve been a bit under the weather the past couple of weeks, so that combined with the longer nights gave me the perfect excuse to curl up on the sofa and bury myself in a great adventure novel. Ever since this summer when I held a big tapas party on the lawn and we all stayed up ’til the wee hours drinking Spanish wine in the moonlight and listening to Paco de Lucia, I’ve been on a big Spanish kick—food, film, music, wine, and so on. Spain, I’m told by people who know these things, is the new Tuscany. I loved For Whom the Bell Tolls and have a soft spot in my heart for those brave folks in the Abraham Lincoln Brigade, the ones who tried to stop Hitler before he could destroy Europe. 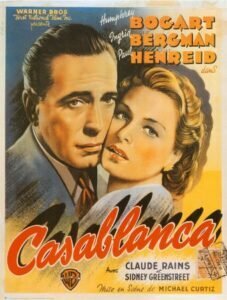 And who doesn’t love Casablanca? 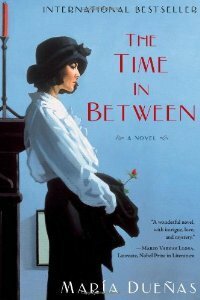 So when Goodreads e-mailed me about this hot, new, word-of-mouth novel by Maria Duenas called The Time In Between, which is set in Spain and Morocco during the Spanish Civil War, I had to read it. BTW if you are a book junkie, and you don’t live anywhere near Vroman’s, or Book Passage, Powells or Elliot Bay Books, get on the Goodreads site. Since I live up here in the sticks far from any great bookstore, Goodreads meets a lot of my bookstore-browsing needs. The Time In Between is 600 fabulous pages long. Perfect for winter. It tells the story of Sira, a young Spanish seamstress forced to live by her wits when a passionate love affair and the Spanish Civil War strand her in glamorous, dangerous Tangier. The rest you’ll just have to find out on your own. 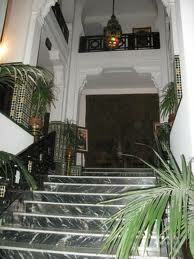 It’s beautifully written and so sensual—you can feel the hot sun beating against the closed shutters, smell the orange bossoms at night and taste the ice-cold champagne at the El Minzah Bar (see the stairway on the left), which was the model for Rick’s Cafe in the movie Casablanca. And speaking of all things Spanish, I’m including my recipe for my go-to date night dish—Gambas al Ajillo. Many years ago when we needed such a thing, Dave and I realized the futility of trying to get a babysitter in Berkeley on a Saturday night, so we just lit candles, put on music, made a fancy but easy dinner and pretended we were dining out. The perfect dish for such an occasion? 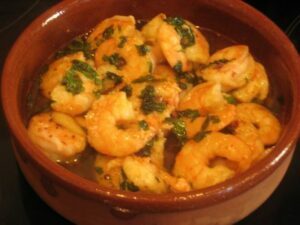 My friend Lynda’s Gambas al Ajillo. Plus, the dish goes well with Champagne, or Spanish Cava, as the case may be. A nice Albarino is good, too, but hey—it’s date night. Splurge! 1. Swirl olive oil in a pan until hot but not smoking. 2. Add hot pepper flakes and shrimp and cook a matter of seconds, just until shrimp are pink. 3. Add garlic and cook for a few seconds to a minute until garlic is golden. Do not burn. Pour shrimp into a warm cazuela, taste for salt, and add if you want ( Be careful. Not too salty) Serve with plenty of good bread to sop up the sauce. The whole menu is something like this. Champagne, olives and Marcona almonds to start. Cook the shrimp while you sip champagne. Serve the gambas and bread, and for desert have seasonal fruit and a young manchego cheese. A perfect meal for when they make The Time In Between into a movie! Then again, We’ll always have . 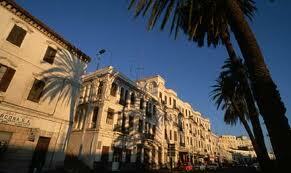 . . Casablanca, as another great date night option.